As a recent graduate, I’ve noticed first-hand that training in the C# programming language isn’t offered very often by universities. And Microsoft Xamarin isn’t usually offered as a course at all! To help bridge the gap for students looking to become Xamarin app developers, we decided to offer free on-campus workshops. We recently held our first workshop at Saxion University in Enschede in cooperation with the ICT student association S.V. Syntaxis. Mark Jonker, our Head of HR & Training, got in touch with Syntaxis to present the idea, and they were enthusiastic from the start. After some planning, the workshop was organized for May 8th, 2018. The evening event followed a similar format to our regular meetups aimed at more experienced developers, but here the focus was on introducing the basics and benefits of Xamarin development. My colleague Maurits, a Xamarin University certified trainer, gave a presentation about getting started with the technology, discussing the ins and outs and why you should use Xamarin to develop apps. He also did some live coding, showing the students how to create a simple weather app in Xamarin. I then gave a presentation (my first as a working developer!) on getting started with Xamarin.Forms, looking at the differences compared to Xamarin native (the part Maurits focused on). I then live coded the same weather app as Maurits but this time using Xamarin.Forms, helping to illustrate the differences between the two options. After a short break, we gave the students the chance to start building a small to-do list app themselves, and provided hands-on support. It was quite interesting to see the different coding knowledge represented among the students, with several already knowing some C# and Xamarin, and others with only knowledge of Java. Luckily, Java is quite similar to C#, so it reduces the learning curve. We had a lot of great feedback about the workshop and plan to offer many more in the coming year! Our next student workshop is scheduled for June 19th at the Hanze University of Applied Sciences, Groningen in cooperation with S.V. RealTime. More details and RSVP. 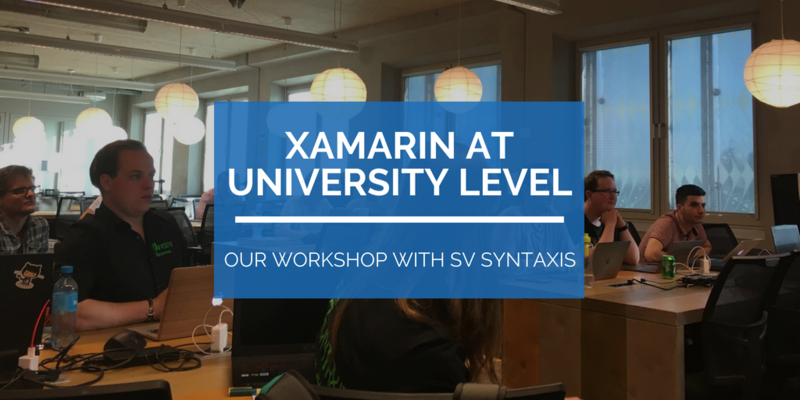 We also have a meetup for developers new to Xamarin in Utrecht this evening – this one is open to everyone so be sure to attend if you’re in the area! More details and RSVP.